Thorne Market Place gets the finishing touch Following a number of requests from local residents, the granite setts were re-pointed last year in order to provide a better walking surface. This work was complemented by a central path of smooth York stone. 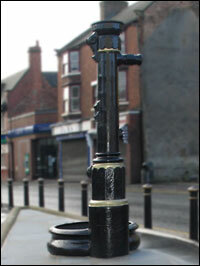 In addition one of the historic pumps was installed at the corner of the Market Place. The contractor for the work was Westmoreland Civil Engineering of Doncaster. The finishing touch has just been provided with the connection of a water supply to the pump to allow it to become a realistic and releasing water feature during the day.